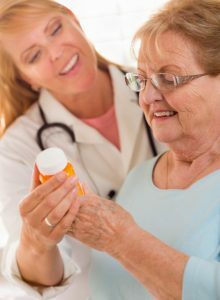 The effects of aging can cause older adults’ bodies to process and respond to medications differently than young people. Age-related changes to the liver, kidneys, heart, and central nervous system can all contribute to overdoses and side effect vulnerability. It’s important for both the elderly and their caregivers to be aware of two kinds of drug interactions that can occur: drug/drug and food/drug. This can include products some people may not think of as drugs, such as alcohol, herbal remedies, and nutritional supplements. Likewise, medicines can interact with foods that seem innocent enough. For example, grapefruit juice should not be consumed with certain blood pressure-lowering medicines and dairy products should be avoided with some antibiotics and antifungal medications. Medication is meant to help people lead happier, healthier, and longer lives, but if they are not safely managed medications can do more harm than good. If you have questions or concerns, be sure to voice them to the proper caregivers and healthcare professionals to ensure safety and peace-of-mind. This entry was posted in Caregivers, Tips and tagged medication, safety. Bookmark the permalink. Both comments and trackbacks are currently closed.